During their younger and more carefree years both Melissa and Harriet were inspired by the food of the streets, the food of everyday life. Whether it was the street vendors selling the salty horneados in Bolivia or the spice and meat filled empanadas of Peru - eating a little of a lot of different dishes became their favourite way to dine. “I love the Spanish tapas style of eating” says Harriet, now a young mum of two and budding foodie entrepreneur. "Around the Mediterranean food is such an occasion. Families and friends get together and take their time with a vast variety of dishes, lots of laughter and lots of time to enjoy the food and the company. Our food is about evoking that kind of feeling” she says. 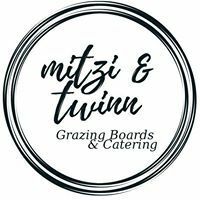 'Mitzi and Twinn' is their new business specialising in food platters for any occasion. ‘Gourmet Grazing Boards’ they call them. Wherever possible the girls use only local fresh ingredients – think Hawkes Bay antipasto with style. If you have a boardroom function to cater, a client get-together in the reception area or a gathering under the trees for your hen party these platters are for you. And everyone is catered for - from vegetarians and vegans to gluten free options. Mitzi and Twinn will cater from Napier to Central Hawkes Bay without adding travel costs. They are home based in Hastings so are very central to their entire marketplace. It’s still early days for the company but their website is very sophisticated and full of beautiful appetising shots of their food. More platter ideas are in the pipeline but if you have a favourite street food style from your travelling days just ask the girls. They will know what to. Melissa Rutherfurd brings chef experience from places like ‘Jeremy’s Restaurant’ in England. But her first memories of food are being raised by a single mum where all the kids had to ‘muck in’ and help in the kitchen. So for her food has always been at the heart of the family and is all about shared experiences and fun. Add to that the delight of variety - and healthy options - and dinner time at her house must be quite an occasion! Harriet Twinn was more ‘front of house’ during her time in restaurants. “I grew up in the catering industry” she says “and I thrived on the high pressure atmosphere of instant customer feedback, instant gratitude and the intellectual challenges of management. Now I want to take those skills and create a business around a food style I love”.